Celery is a plant species, Apium graveolens, in the parsley family (Apiaceae or Umbelliferae). The domesticated form Apium gravelens var. dulce is grown for its edible leafstalks, leaves, fruits, and roots. 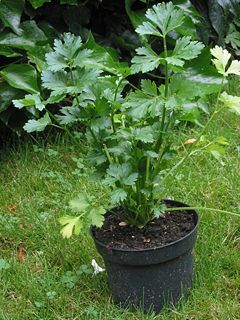 The term celery also is used for the crisp, edible leafstalks (petioles) of this plant and for the edible seed-like fruits that serve as a flavoring. The term celeriac is used for a specially selected cultivar group (Apium graveolens Rapaceum Group) of celery that is grown as a root vegetable for its large taproot, rather than the stem or leaves. Cultivars of the species Apium graveolens have been used for centuries, while others have been domesticated only in the last 200-300 years (Zohary and Hopf 2000). The plant provides a number of values for the ecosystem and human beings, including as a source of food for animals, such as rabbits and Lepidoptera, and a nutritious food for humans. Its unique flavor and texture brings joy to people. Human creativity has learned to cultivate this vegetable, produce many varieties, and to prepare it in many ways. Apium graveolens is a member of the Apiaceae or Umbelliferae family (both names are allowed by the International Code of Botanical Nomenclature). This family comprises unusually aromatic plants with hollow stems, including the cumin, parsley, carrot, parsnip, dill, caraway, fennel, and other relatives. The family also includes some highly toxic plants, such as hemlock. Apiaceae is a large family with about 300 genera and more than 3,000 species. The earlier name Umbelliferae derives from the inflorescence being in the form of a compound "umbel." The small flowers are radially symmetrical with five small sepals, five petals, and five stamens. Apium graveolens is native to the Mediterranean and the Middle East and is found in the wild state in much of the north temperate Old World. Apium graveolens grows to one meter tall. The leaves are pinnate to bipinnate leaves with rhombic leaflets three to six centimeters (cm) long and two to four cm broad. The flowers are creamy-white, two to three millimeters (mm) diameter, produced in dense compound umbels. The seeds are broad ovoid to globose, one and a half to two mm long and wide. The edible celery stalk is not a plant stem as often claimed. It is a petiole, which is part of a leaf. The closely related Apium bermejoi from the island of Minorca is one of the rarest plants in Europe with only 60 individuals left. Zohary and Hopf (2000) note that celery leaves and inflorences were part of the garlands found in the tomb of Tutankhamun, pharaoh of ancient Egypt, and celery mericarps dated to the sevenh century B.C.E. were recovered in the Heraion of Samos. However, they note "since A. graveolens grows wild in these areas, it is hard to decide whether these remains represent wild or cultivated forms." Fragiska (2005) mentions another archeological find of celery, dating to the ninth century B.C.E., at Kastanas, Greece. However, the literary evidence for ancient Greece is far more abundant. In Homer's Iliad, the horses of Myrmidons graze on wild celery that grows in the marshes of Troy, and in Odyssey there is mention of the meadows of violet and wild celery surrounding the cave of Calypso (Fragiska 2005). 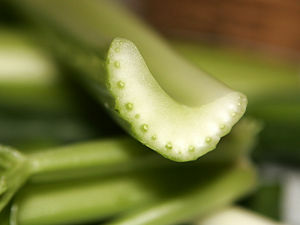 A chthonian symbol (pertains to, gods or spirits of the underworld, especially in relation to Greek religion), celery was said to have sprouted from the blood of Kadmilos, father of the Cabers, chthonian divinities celebrated in Samothrace, Lemnos, and Thebes. The spicy odor and dark leaf color encouraged this association with the cult of death. In classical Greece, celery leaves were used as garlands for the dead, and the wreaths of the winners at the Isthmian Games were first made of celery before being replaced by crowns made of pine. According to Pliny the Elder (Natural History XIX. 46), in Archaia the garland worn by the winners of the sacred contest at Nemea was also made of celery (Fragiska 2005). There are two main varieties of celery grown today: Pascal celery, which is pale green and the most common variety, and Golden celery, which is grown under cover (a layer of soil or paper) to prevent chlorophyll from developing and imparting the green color (Herbst 2001). In North America, commercial production of celery is dominated by Pascal celery. Gardeners can grow a range of cultivars, many of which differ little from the wild species, mainly in having stouter leaf stems. They are ranged under two classes, white and red; the white cultivars being generally the best flavored, and the most crisp and tender. The wild form of celery is known as smallage. It has a furrowed stalk with wedge-shaped leaves. The whole plant has a coarse, rank taste and a peculiar smell. With cultivation and blanching, the stalks lose their acidic qualities and assume the mild, sweetish, aromatic taste particular to celery as a salad plant. The plants are raised from seed, sown either in a hot bed or in the open garden according to the season of the year. After one or two thinnings out and transplantings, the plants are, on attaining a height of 15-20 cm, planted out in deep trenches for convenience of blanching, which is affected by earthing up to exclude light from the stems. In the past, celery was grown as a vegetable for winter and early spring; because of its antitoxic properties, it was perceived as a cleansing tonic, welcomed after the stagnation of winter. Apium graveolens is used around the world as a vegetable, either for the crisp stems or fleshy taproot. In temperate countries, celery also is grown for its seeds, which yield a valuable volatile oil used in the perfume and pharmaceutical industries. Celery seeds can be used as flavoring or spice, either as whole seeds or, ground and mixed with salt, as celery salt. Celery salt can also be made from an extract of the roots. Celery is used as a seasoning, in cocktails (notably to enhance the flavor of Bloody Mary cocktails), on the Chicago-style hot dog, and in Old Bay Seasoning. Celery is one of three vegetables considered the holy trinity (along with onions and bell peppers) of Louisiana Creole and Cajun cuisine. It is also one of the three vegetables (together with onions and carrots) that constitute the French mirepoix, which is often used as a base for sauces and soups. Celery is a source of vitamin C and fiber. There is a common belief that celery is so difficult for humans to digest, since the carbohydrates are in the form of indigestible cellulose, that it has "negative calories" because human digestion burns more calories than can be extracted. Mikkelson and Mikkelson (2007) believe this to be true; however at only 6 kcal per rib, the effect is negligible. Celery is still valuable in diets, where it provides low-calorie fiber bulk. Some pet rabbits eat a lot of celery. One may wonder if this means rabbits lose a lot of weight. However, a rabbit's natural flora of bacteria in their appendix includes microorganisms that break down the cellulose in the celery into a form which the rabbit can absorb. Celeriac, also known as "celery root," "turnip-rooted celery," or "knob celery") is a specially selected Cultivar Group of celery, grown as a root vegetable for its large and well-developed taproot. The root is used when it is about 10-12 cm in diameter, or the size of a large potato. Celeriac may be used raw or cooked. It is best to peel celeriac before use, since the outer skin is tough and stringy. It has the celery flavor, so it is often used as a flavoring in soups and stews; it can also be mashed or used in casseroles and baked dishes. Celeriac has good keeping properties and should last three to four months if stored between 0° and 5° C and not allowed to dry out. Nutritionally, celeriac is low in carbohydrates. Celeriac is not as popular as other root vegetables, especially in the Western hemisphere, very possibly because of its garish appearance before cleaning: it has been described as "a vegetable octopus" in reference to the tangle of rootlets that grow at the base. There are numerous cultivars available, especially in Europe, where root vegetables are popular. Prior to the sixteenth century, the use of celery was primarily as a medicinal herb (Herbst 2001). It subsequently gained use as a flavoring and then a food. The use of celery seed in pills for relieving pain was described by Aulus Cornelius Celsus around 30 C.E. (Celsus 1938). The whole plant is considered by some to be gently stimulant, nourishing, and restorative; it can be liquidized and the juice taken for joint and urinary tract inflammations, such as rheumatoid arthritis, cystitis, or urethritis, for weak conditions and nervous exhaustion. The seeds, harvested after the plant flowers in its second year, are the basis for a homeopathic extract used as a diuretic. The extract is believed to help clear toxins from the system, so are especially good for gout, where uric acid crystals collect in the joints, and arthritis. They are also used as a mild digestive stimulant. The extract can be combined with almond or sunflower oil, and massaged into arthritic joints or for painful gout in the feet or toes. The root is considered by some to be an effective diuretic and has been taken for urinary stones and gravel. It also is held to act as a bitter digestive remedy and liver stimulant. A tincture can be used as a diuretic in hypertension and urinary disorders, as a component in arthritic remedies, or as a kidney energy stimulant and cleanser. Celery roots, fruits (seeds), and aerial parts, have been used ethnomedically to treat mild anxiety and agitation, loss of appetite, fatigue, cough, and as a anthelmintics (vermifuge). Cross-section of a Pascal celery stalk. The following are some precautions in terms of the use of celery. Bergapten in the seeds could increase photosensitivity, so it is advised not to apply the essential oil externally in bright sunshine. Likewise, it is recommended to avoid the oil and large doses of the seeds during pregnancy, since they can act as a uterine stimulant. Seeds intended for cultivation are considered to not be suitable for eating as they are often treated with fungicides. Although many people enjoy foods made with celery, a small minority of people can have severe allergic reactions. Celery is among a small group of foods (headed by peanuts) that appear to provoke the most severe allergic reactions (anaphylaxis). For people with celery allergy, exposure can cause potentially fatal anaphylactic shock (Celestin and Heiner 1993). The allergen does not appear to be destroyed at cooking temperatures. Celery root—commonly eaten as celeriac, or put into drinks—is known to contain more allergen than the stalk. Seeds contain the highest levels of allergen content. An allergic reaction also may be triggered by eating foods that have been processed with machines that have previously processed celery, making avoiding such foods difficult. In contrast with peanut allergy being most prevalent in the United States, celery allergy is most prevalent in Central Europe (Bublin et al. 2003). Bublin, M., C. Radauer, I. B. H. Wilson, D. Kraft, O. Scheiner, H. Breiteneder, and K. Hoffmann-Sommergruber. 2003. Cross-reactive N-glycans of Api g 5, a high molecular weight glycoprotein allergen from celery, are required for immunoglobulin E binding and activation of effector cells from allergic patients. FASEB Journal 17: 1697-1699. Retrieved August 19, 2007. Celestin, J., and D. C. Heiner. 1993. Allergy and immunology: Food-induced anaphylaxis. West. J. Med. 158(6): 610-611. Celsus, de Medicina. 30 C.E./1938. Celsus: De Medicina—The text on LacusCurtius. Thayer website. The Latin text is that of the Teubner edition by F. Marx, 1915, as reprinted in the Loeb edition, 1935 (Vol. I) and 1938 (Vols. II and III). The Text on LacusCurtius The English translation is that by W. G. Spencer, first published in 1938 as part of the Loeb Classical Library. Retrieved August 19, 2007. Fragiska, M. 2005. "Wild and cultivated vegetables, herbs and spices in Greek antiquity." Environmental Archaeology 10(1): 73-82. Harper, Douglas (2001). Etymology of celery. Etymonline. Retrieved January 5, 2005. Mikkelson, B., and D. P. Mikkelson. 2007. Stalk marketed. Snopes. Retrieved August 19, 2007. Shadick, N. A., M. H. Liang, A. J. Partridge, et al. 1999. "The natural history of exercise-induced anaphylaxis: Survey results from a 10-year follow-up study." J Allergy Clin Immunol 104(1): 123-127.